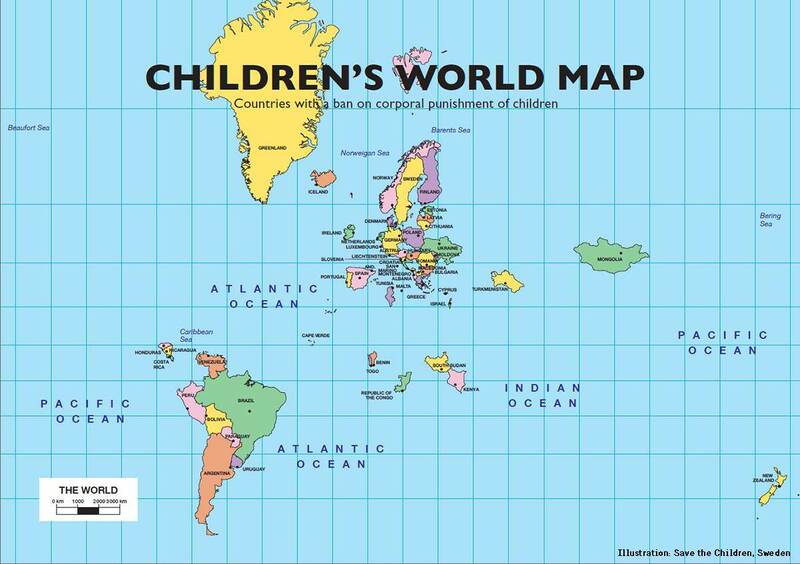 The map above titled ‘Children’s World Map’ only shows countries with a ban on corporal punishment for children and was created by Save The Children Sweden. Sweden became the first country to fully outlaw corporal punishment in 1979. And as of 2018, a total of 53 countries have followed suit (as the map above shows). You can learn more on the Save the Children International website. I thought Scotland had also done this (it’s a devolved matter and not the full UK whose laws apply). South Africa is not there………..how come ???? I would instead make a list of the normal countries that did not have such a law. In a democratic state it is not of the governments bussiness to decide for parents how to raise their children, this reminds us of autocratic states that gets involved in everyone’s private lives. There are many different – traditional and non traditional – methods of raising children, and a parent should have the right to choose. What was wrong with the approach from govenments before the intiative of Sweden when abuse of children was never allowed but reasonable corporal punishment like spanking was up to the choice of parents ? Too right! Why should the nanny state interfere with an individual’s right to assault someone. If I want to slap my neighbour or spank my kid, that’s nobody’s business but my own! Let’s check back in and see how society is doing with this a little down the road. Why isn’t there Czech Republic? Nepal just recently banned corporal punishment on September 2018 making it 54 countries now.